Guaranteed sunshine almost every day of the year is just one of the reasons why you should choose Pafos to indulge in your favourite sport & leisure activities. Whether you just want to play for fun while relaxing in idyllic surroundings, or are a professional athlete looking for training, there are facilities for everyone, from football and golf to water sports and hiking. And since leisure activities do not mean the same thing to everyone, Pafos offers other ways for you to indulge yourself. If shopping is your idea of a fun day out, the bustling shopping centres have everything from local handicrafts to designer labels. If a varied nightlife is what it takes, enjoy a drink or a meal at the numerous bars and restaurants, or dance to the latest rythms at one of the towns stylish nightlife. And after the exertions of the day are done you can put up your feet and relax in your own comfortable accommodation. There is a myriad of sporting activities available in Pafos. Try your hand at bowling or a game of mini golf. Experience the closet thing to being a Formula 1 driver by zooming round a karting track. Go hourse riding into Peyia forest, along the beaches and into the beautiful sea caves. 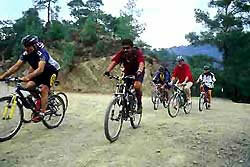 The region of Pafos is a great place for hiking and cycling both for the sport and as a means to explore the region. There are four top class golf courses in the Pafos region, while a few others currently under construction. For more information on sport & leisure activities please select a category from our list below. With par facilities in beautiful surroundings, Pafos is the latest destination on the golfing map, a place where you can play the game all year round. There are four top class golf courses in the Pafos region, while a few others currently under construction. Situated in peaceful surroundings amidst landscaped hills with spectacular views, these offer luxury villas or apartments for rent or sale, clubhouses, shops, hotels and all the necessary facilities. They are far from the hustle and bustle of the main tourist resorts, yet near enough for easy access. Unique, peaceful, winding through dramatic settings and a cliff backdrop with views to the ocean - two new fantastic 18-hole golf courses lie at the heart of Venus Rock. These new courses have been designed to ensure that, whether you are a professional seeking to play some of the toughest holes available, or an amateur out to enjoy a relaxing day with friends. Tony Jacklin, four times Ryder Cup captain, winner of the British Open and US Open, has personally helped design the two courses at Venus Rock, influencing every aspect, from the placement of the tees, to the shaping of the fairways and positions of the bunkers. The new courses will be designed to compliment the natural characteristics of the area to make the most of the secluded valley setting with views over to the Mediterranean. Situated at the heart of the prestigious Eléa Estate in Cyprus, Eléa Golf Club offers world-class golf in a stunning setting. The challenging Par 71 course, designed by the legendary Sir Nick Faldo, incorporates numerous natural features and boasts stunning views of the Mediterranean. Eléa will help Pafos to be placed on the golfing map as a leading golf destination, and the combination of great golf and meticulous attention to detail – the hallmark of the Eléa experience –will ensure it quickly becomes a destination of choice for golfers across the globe. Cyprus is a natural mountain-biking place. Its terrain offers many opportunities for exciting mountain biking in different tracks, making the island a paradise for the sport’s fans. Due to the excellent weather conditions prevailing on the island, cycling sports can be enjoyed almost throughout the year. Facilities for renting bicycles are available everywhere. General traffic regulations correspond to those in Europe, but traffic in Cyprus moves on the left hand-side, NOT ON THE RIGHT. Cyclists are advised to avoid cycling along the main roads at weekends, especially in the summer when traffic is very heavy. If possible, cyclists, should also avoid riding due west in the late afternoon, as the glare of the setting sun can be unpleasant and potentially dangerous. Sunglasses and sunhat, at all hours of the day, during the summer months, are most advisable. Pafos during winter is an ideal place for teams to stay and have their training. A number of north European football teams choose to come here to train during the winter months thanks to the sunny weather and excellent facilities. First of all the climate is excellent. Dry and not so cold ideal for training. Many of the facilities of almost all hotels in Pafos are used by football teams. (Restaurants, laundry, conference facilities for training sessions etc). Some football pitches in Pafos are in a very good condition and are acceptable even by famous football clubs. Also bus transportation is very easy and cheap since distances are short between airport, hotels, and football pitches. Amateurs can enjoy five a side football on artificial grass pitches available for rent on an hourly basis. Tennis is enjoyed today by Cypriots and visitors to the island. Tennis is enjoyed today by Cypriots and visitors to the island. There are municipal tennis courts as well as private facilities in most hotels and hotel apartment complexes, mainly hard or artificial grass. Cyprus is the ideal place for tennis all the year round, even in the summer, thanks to cool westerly breezes and floodlighting. Various competitions and tournaments are organised throughout the year. The Cyprus Squash Rackets Association, formed in 1983, is a member of the International and European Squash Federations. Due to growing interest in this game, squash courts now exist in most good hotels. Bowling There are various Bowling Greens in Pafos and one bowling club. They offer all weather flat bowling green, two Rinks 5x14 feet, easily converted to international size, master score boards and equipment hire. Very few countries in the world are blessed with such a favourable climate for diversity in seasports enjoyment. Very few countries in the world are blessed with such a favourable climate for diversity in seasports enjoyment. Pafos is really the ideal spot with a full range of water sports available throughout the year. Sea sports offices in all hotel resorts provide facilities for water-skiing, wind surfing, sailing, canoeing, pedaling, parascending, yachting, jet skiing, etc. Fishing in Pafos has always been an exciting sport and is becoming more and more popular all the time. Fishing can also be enjoyed at dams, all found in beautiful natural surroundings, providing excellent fresh-water fishing opportuneties to anglers. Cypriots and visitors are invited to enjoy this sport. Fishing in Pafos has always been an exciting sport and is becoming more and more popular all the time. Fishing can also be enjoyed at dams, all found in beautiful natural surroundings, providing excellent fresh-water fishing opportuneties to anglers. Cypriots and visitors are invited to enjoy this sport. Today, the water in the dams is classified as very rich and there is a wide variety of fish. A special licence at a small fee is available from the Fisheries Department, telephone + 357 26240268 . Also anyone who wants to test his fishing prowess can try the beautiful sandy beaches around Pafos. No licence is required for salt water rod fishing. Spear-fishing (without aqualung) angling, fishing with vertical lines or trolling are the permitted methods for which no licence is required. Special (sport) fishing licences are required by law for those fishermen who use: - Boats and fishing-nets, longlines and traps, - Spearguns with an aqualung - Spearguns with lights at night-without aqualung - Nets without a boat. The licences have several conditions attached to them that regulate the gear used, the days, the licensees are allowed to fish and in certain cases (spearguns with aqualung and fishing at night with light), the allowable catches for each fishing trip. Species of fish which can be caught: sea-breams, groupers, amber jacks, sea-perch etc. Pafos is surrounded by crystal clear, unpolluted seas, with sea water temperatures ranging from 27 to 16 degrees Celsius. Diving - sub-aqua activities Pafos is surrounded by crystal clear, unpolluted seas, with sea water temperatures ranging from 27 to 16 degrees Celsius. Submarine cliffs and valleys, coral colonies, sea anemones and sponges, brightly coloured fish and sea-shells, and ancient ship wrecks, are among the many breathtaking sights that divers can enjoy. Numerous diving centres in Pafos offer diving services to those who want to enjoy the beauty of the big blue sea. There are no dangerous underwater currents in any of the recommended diving areas. A few diving schools in Pafos also offer diving lessons with qualified instructors and offer certificates to anyone who successfully completes the course. Open water (OW) qualification required. Access is from the shore just past the headland at Coral Bay, a short walk along the rocks. This is a particularly popular dive, ranging from 4 metres to about 12 metres. It takes its name from the natural formation resembling an amphitheatre that the sea currents have cut out of the rock. Besides the magnificent rock formations, there is an abundance of marine life to admire, including groupers, eels and cuttlefish. Open water (OW) qualification required. There are a number of caves, including one with an amphorae encrusted roof, and gullies to explore at a depth of 5 to 12 metres. Open water qualification required. Access is by boat. Located off the northwest coast of Pafos in the Akamas area, this dive combines caves and interconnecting tunnels at a depth of some 11 metres. If you are lucky you may spot a green and leatherback turtle during the turtle season. There is plenty of marine life to admire around the rock formation. Open water qualification (OW) required. Access is by boat some 25 minutes from Pafos harbour. This Lebanese freighter ran aground in shallow water in 1972 and was initially used as target practice by the army. But it was later declared a hazard to other ships and blown up in 1974. It now rests in a crater created by the explosion, 11 metres underwater. Very close are two large archways and narrow tunnels suitable for experienced divers. There is also plenty of marine life to observe. Open water (OW) qualification required. This former Russian fishing vessel sank at sea, close to Pafos harbour in 2006 as she was being towed to Lemesos (Limassol) to be scrapped. She now lies on a rocky bottom, 14 to 18 metres underwater and is home to groupers, bream and other fish. With four karting centres in the area, Pafos is a great place for driving afficionados. Karting in Pafos With four karting centres in the area, Pafos is a great place for driving afficionados. All have a range of karts to suit both the novice driver or to test the more experienced, guaranteeing that there is something for everyone. Come and race your friends, family and colleagues and feel the thrill of speeds of up to 70mph. Paintball in Cyprus became legal in May 2004. If you enjoy bowls, you can indulge in your passion in Pafos. • All Bowling Greens are near hotels, therefore no transfer is required. • The Green Bowl are all weather flat Bowling Greens (23metres X 37 metres and 37m X 37m) rinks. • Surface shoes of all sizes at a small charge. • Bowling – Bowl set: available at a small charge. • Gym for light fitness: Free on most hotels. • Hard surface Tennis Court – daytime: Free on most hotels. • Friendly games may be arranged.